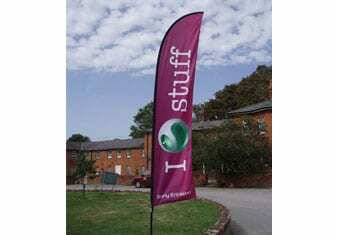 Wing banners are very eye-catching portable flags whether used outdoors in clusters or for indoor events. 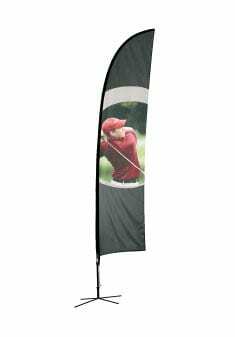 They are engineered to allow double sided printing as an option to increase brand visibility. The have an innovative rotating mechanism which allows them to move with change in wind direction. They come supplied with a ground stake as standard but are also compatible with the additional hardware such as weighted bases. Durable construction ensures longevity and so great value for money. It is possible to just replace the flag to update your message and re-use the wing banner hardware for the next campaign. 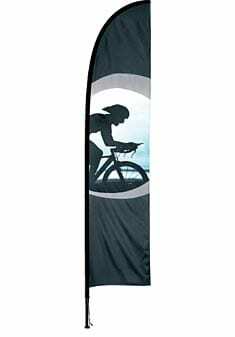 They are lightweight & portable too with the extra large wing banner weighing in at just 5kg which for a display of 6.7m in height is really something.